Heat oven to 350°F. Cook 1 box (12 oz) jumbo pasta shells as directed on box. Meanwhile, place thin layer of sauce from 1 can (10 oz) Old El Paso™ red enchilada sauce in bottom of 9x9-inch square (2-quart) glass baking dish. Set aside. In sauté pan or 10-inch skillet, cook 1 1/2 lb boneless skinless chicken, cut into bite-size pieces, over medium-high heat until no longer pink in center. Season with salt and pepper. 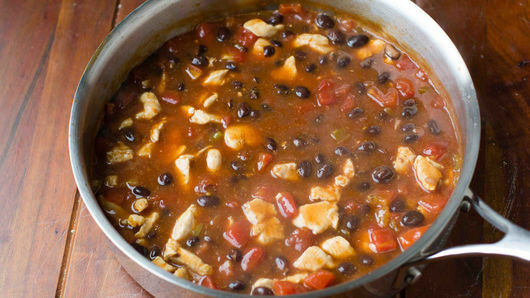 Add 1 can (10 oz) diced tomatoes with green chiles, undrained, and remaining red enchilada sauce to chicken. Simmer over medium-high heat while pasta continues to cook. 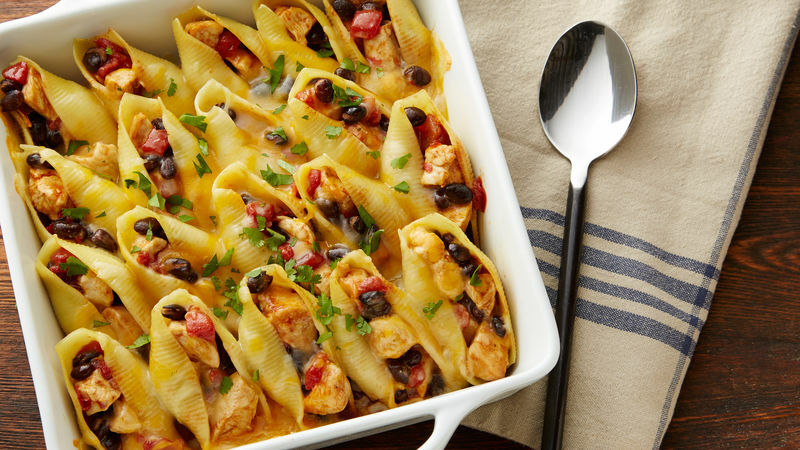 During last 5 minutes of pasta cooking time, add 1 can (15 oz) can Progresso™ black beans to chicken mixture; stir gently to mix and continue to simmer. Drain pasta. 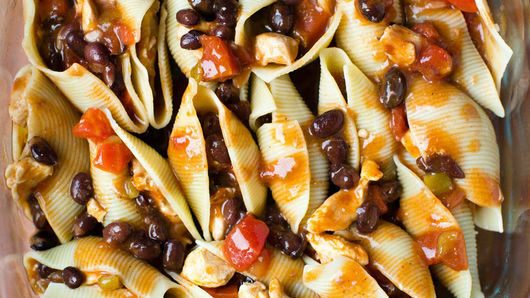 Carefully spoon chicken mixture into each pasta shell; place side by side in baking dish. Sprinkle 1/2 to 1 cup shredded Mexican cheese blend over top. Bake 15 minutes or until cheese is melted. Garnish with chopped fresh cilantro before serving. Add sour cream and salsa as garnish, if desired. To save time, use deli rotisserie chicken. Leftovers can be refrigerated for up to 3 days.